Included below is Moses Becker's patent for his Improved Stomach Bitters. Letters Patent no. 94,466, dated September 7, 1869. To all whom it may concern: Be it known that I, Moses Becker, of Philadelphia, in the county of Philadelphia, and State of Pennsylvania, have invented new Stomach - Bitters; and I do hereby declare the following to be a clear and exact description of the nature thereof, sufficient to enable others skilled in the art to which my invention appertains, to fully understand and use the same. Two pounds herb Centaur minor. Two pounds pure ground nutmeg. One pound pure ground calamus. I place all the aforesaid ingredients in a suitable vessel, and allow them to remain until the spirits have extracted the flavor and strength of the other ingredients. I then filter the compound, and afterwards draw it off in bottles, kegs or casks, as most convenient or desirable. It will be found that I produce and article which is useful for all medical purposes to which bitters are applied or recommended, is a gentle stimulant, and possesses a pleasant and agreeable flavor as a drink, whether for private or bar-room uses. The proportions of the various ingredients may be varied to suit the taste. Having thus described my invention, I claim the within-described, my stomach-bitters, compounded of the ingredients, and in about the proportions as described. In testimony that I have claimed the foregoing as my own, I have affixed my signature, in presence of two witnesses. 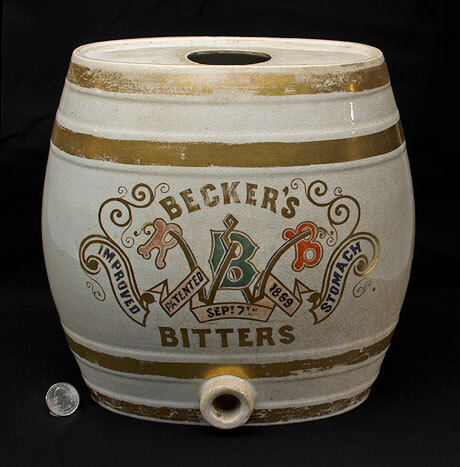 This bitters advertising dispenser was offered in our Premier Auction 146, March 6-15, 2017.